Fourteen local start-ups have benefitted in the past year from a novel idea by Innovative Design Inc. (IDI) to provide free design and prototyping services on an “as time permits” basis. As described in this May article on teknovation.biz, owners Cindy and Michael Hollander embraced the idea first advanced early last year by Kevin Fillers, IDI’s Business Manager, to help financially-strapped start-ups with something any product-focused company needs – a viable design and prototype. Fillers has been a frequent attendee at local entrepreneurial events such as the “What’s the Big Idea?” (WTBI) sponsored by The Development Corporation of Knox County. During those pitches, he saw that many entrepreneurs needed a more refined design and professional prototype if they were going to be successful in securing investors and customers. He saw a clear match between IDI’s expertise and the need. That’s the focus of IDI’s Entrepreneur Assistance Program. As noted in the previously referenced teknovation.biz article, Grow Bioplastics was its first client. “Tony (Bova) and Jeff (Beegle) were trying to learn SolidWorks,” Fillers said in citing a widely-used computer-aided design and manufacturing software. 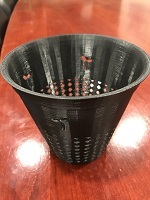 IDI’s staff already had the knowledge in how to efficiently use the software to achieve Grow Bioplastics’ need for a well-designed model for a biodegradable pot. Another recipient of IDI support was Martin Wade who competed in the 2014 edition of WTBI. He’s developing a multi-use, portable sink that continuously exchanges dirty water with fresh water, and IDI helped him with a more functional design and prototype. IDI also helped TrapBeats, a 2017 WTBI finalist that is focused on developing sound dampening panels with aesthetic designs for college students or consumers living in apartment-styled homes. “My favorite was a culinary-degreed entrepreneur whose idea was a bowl threaded with holes to help with defrosting foods,” Cindy Hollander says. While the new initiative allows the 20-year old company that Cindy founded to give back to a community that has embraced IDI, there’s also a value for the designers and engineers. “They love to collaborate and learn new things,” she says of her team that specializes in mechanical, structural, electrical, environmental, and process-related projects. Fillers works closely with organizations whose are focused on helping entrepreneurs. Those include the Knoxville Entrepreneur Center, Knoxville Chamber’s “Young Entrepreneurs Academy,” Knoxville Area Urban League and its “Endeavor” initiative, and the Anderson Center for Entrepreneurship and Innovation in the Haslam College of Business at the University of Tennessee. “We prefer people to come to us through a referral from an organization like these,” Fillers says, explaining that it is important for start-ups to have good mentoring so that the free services from IDI are more likely to produce a successful outcome. Those interested in learning more about Innovative Design’s program can contact Fillers via email (kevin@idi-tn.com).